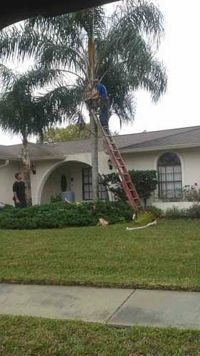 Morris Tree Service is a family-owned and -operated company offering reliable tree care services to customers in Pinellas, Pasco and Hernando counties. Our well-trained arborists will inspect your trees thoroughly and recommend the best possible solution. We offer quality tree removal services, sod removal and stump grinding services at affordable prices. Whether you need tree trimming or tree removal services, we will handle it all based on your needs. Morris Tree Service has a team of specialists who are trained to trim your trees and shrubs efficiently. Rely on us for property cleanup, dirt removal and other related services. For more information about our services, reach out to us at (727) 478-1574. $100 Off Tree Services Worth $600 or More!